In a footballing world filled with rumours and assumptions based on reports and fake news, it is understandable for a player to use social media platforms to bring forward nothing but the truth for the fans and those who are involved. 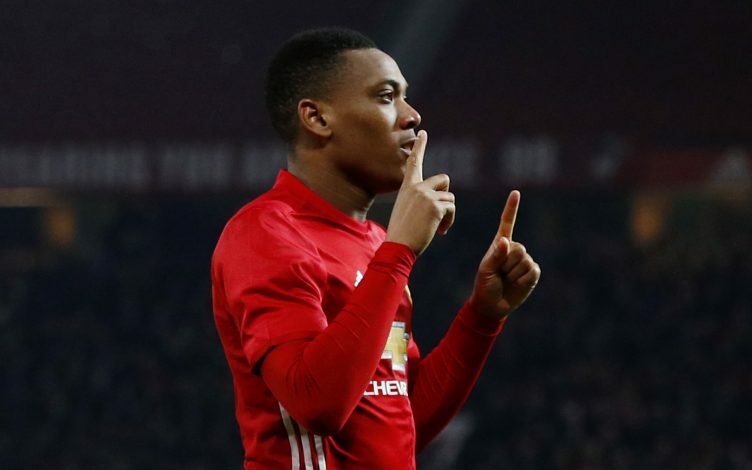 Anthony Martial was the latest player to use this approach as he took to Twitter to clarify that he is still a Manchester United player by heart and sleeve and all the rumours and reports surrounding him and his exit are completely wrong. Martial has been getting a considerably low amount of game time this season under Mourinho and the manager has been open to criticise the player in front of the press on more than one occasion. The French striker has since been the centre of news when it comes to the club and heavy reports of him leaving the Red Devils have emerged in large numbers in the months gone by. However, the French winger who is also dubbed as the next Thierry Henry, uploaded this on twitter, “Dont listen the papers it’s wrong thanks Come on United” and probably calmed down the nerves of fans who did not want to see him leave. Martial and Mourinho have found it tough to get along and with the likes of Mata, Rashford, Mkhitaryan and Lingard to compete against for a playing place, the boy needs time and patience to prove his worth to the club and manager. Martial has not featured since providing two assists in a 4-0 win over Wigan in the FA Cup at the end of January, but time will surely see him get back on the field and prove his tag as a Red Devil striker. The player has scored six goals in all competitions so far this season after making 22 appearances and is ready to go ahead and make those stats better when the chance arrives.